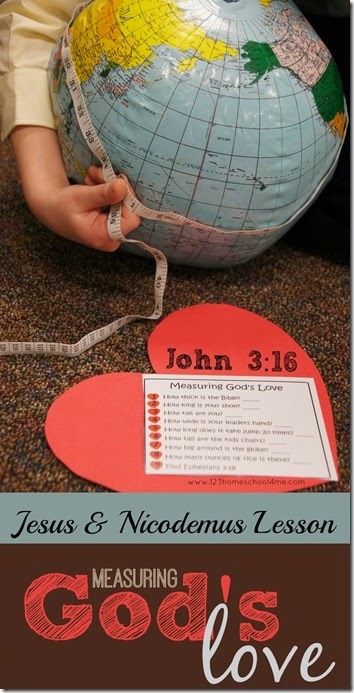 This is a really fun, hands on Sunday school lessons that is a Jesus and Nicodemus Lesson that talks about measuring God’s love using the text John 3:16. This is a wonderful lesson for the month of February and Valentines Day. This weeks Jesus and Nicodemus Lesson covered John 3:1-21 and measuring God’s love and we did lots of hands on kids activities and crafts themed around Measuring God’s Love and John 3:16. This lesson is perfect for 1st grade, 2nd grade, 3rd grade, 4th grade, or 5th grade kids especially in February around Valentines Day. We started about by giving each of the kids a ruler, a pen, and this card (printable included below). On it were several things for them to measure. We explained that these were ways for the kids to measure distance, time, height etc. 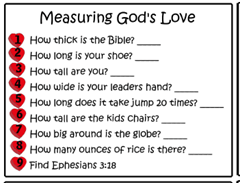 in preparation for our lesson today when we were going to measure God’s love for us. We had several stations with stop watches to measure time, tape measures to measure height, measuring cups to measure rice, and more. When we came back together as a group, we talked about how we can measure things, but can’t measure God’s love; it is infinite! And it will NEVER run out! 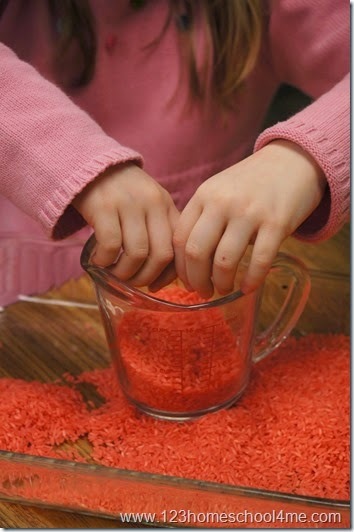 This is such a cute, simple craft for kids! 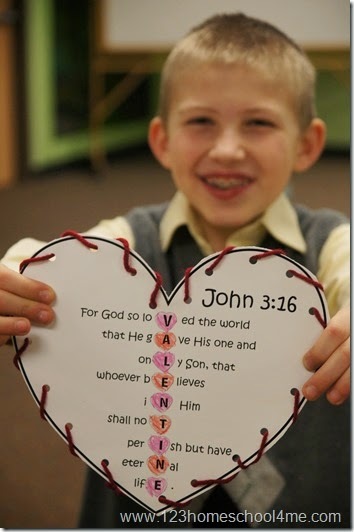 Just print the John 3:16 Valentine Heart below on cardstock. Then, the kids will use a hole punch to make holes around the heart. Next they will color in the hearts in the center that spell “valentine”. Finally, they will use about 2 feet of red yarn to sew the heart. around the outside. The kids really enjoyed this craft and it was perfect to make right around Valentines Day. We encouraged the kids to think if there was someone they knew they could give the heart to, to share God’ love with others! You are welcome to use this at home, at church, homeschool coops, etc. I don’t see the Jesus and Nicodemus lesson on TPT. I am the Director of Children’s Ministry at our church. I would like to offer the craft and measuring activity to our volunteers. Is there something I am missing or a way to purchase for use in our Sunday School classes? Thanks! you are welcome to use any of our bible crafts FREE at churches as long as they are unaltered. I can not find this lesson on your TPT Store either. Is there another way to access this lesson? I don’t see a link to view/download the Jesus/Nicodemus lesson…? These are all the hands on activities / crafts we used for the lesson to supplement the Sunday School curriculum we were given to make it more engaging. You could grab a video from you tube, read teh story from the Bible, do a skit or puppet show of the story from the Bible in John 3:1-21.